So how is this possible when 3D TVs and movie theaters still require you to wear shutter or polarized glasses, and Nintendo’s 3DS relies on a front-facing camera to track the position of the user’s head and face? It all comes down to a clever trick with the HoloFlex phone’s unique display. The device starts with a 1920 x 1080 resolution OLED touchscreen display, but images are displayed as an array of 12-pixel wide circles. When viewed through a special 3D-printed overlay that’s covered in 16,000 tiny fisheye lenses, those images appear to pop-off the screen. And as the phone is angled and moved around, 3D objects can be viewed from almost any angle. The downside is that the images end up having a relatively poor resolution of just 160x104 pixels, but as screen resolutions and manufacturing technologies improve, eventually that special lens-covered overlay will be invisible to the naked eye. 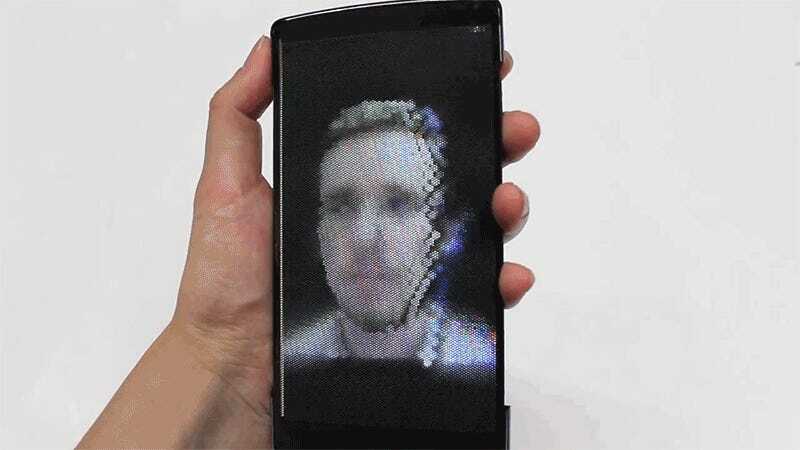 But 3D images aren’t the HoloFlex phone’s only party trick. The OLED display it uses is completely flexible, allowing the phone to be bent and warped, introducing an additional element of interaction. Besides tapping the screen, and other touch gestures, users could play games like Angry Birds by physically bending the phone back to draw back the bird-launching slingshot. It also means if you were to forget about the HoloFlex in your back pocket when you sat done, there’s little risk of finding a shattered screen when you get back up.